This Tuesday is Pancake Day, which provides us all with an excellent excuse to cook up a special breakfast, whether the day has religious significance for us or not. In the Christian calendar, the forty days of Lent leading into Easter begin on Ash Wednesday (which falls on March 1 this year). 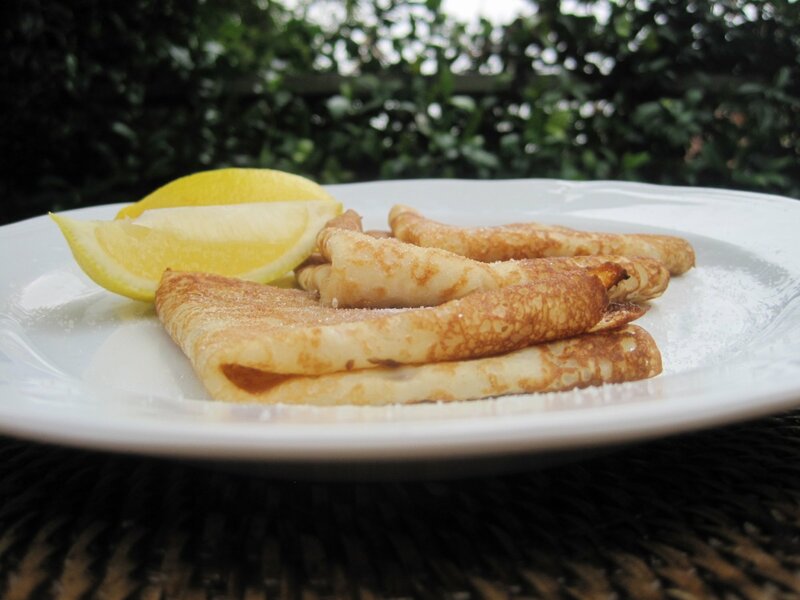 Shrove Tuesday, or Pancake Day, is the day before and was originally a feast day. Lent is a period when Christians give up things and traditionally meat, fish, eggs, and dairy products were not eaten. Pancakes were made on Shrove Tuesday to use up these ingredients before Lenten fast began. Today’s recipe is for crepes. They are delicate, lacy French pancakes made from a simple batter. One of the best ways to enjoy them is simply straight from the pan with a squeeze of lemon and sprinkle of caster sugar, or some maple syrup or Nutella. They can be filled and rolled or stacked with different vegetables, seafood and sauces or for dessert with fruit or jam. They are delicious and easy to make, although they may take a little practice in the beginning. You will need a small non-stick frying pan or specialist crepe pan with a base of about 15cm across or for larger crêpes 20cm across. It is best to make the batter an hour ahead or even the night before. Put the milk, eggs, flour, oil or melted butter and salt in a blender or food processor and blend for a minute. Scrape down the sides and blend again. It should be the consistency of thin cream. Alternatively the batter can be made in a bowl with a whisk. Mix the batter again just before using and thin with a little milk if too thick. Heat the crepe pan over medium heat and brush with a folded paper towel and butter or oil. Use a ladle or cup quarter cup measure for tipping in the batter for each crêpe. Lift the pan off the heat and pour in the batter. Move the pan around so the batter thinly covers the base. If you add too much or the batter, just tip it back. Return the pan to the heat and cook for about a minute until bubbles form and the underside is light golden brown. Turn the crepe over with a spatula. Cook the second side for about 30 seconds until spotted light brown. Remove the crepe and place on a rack to cool. Continue cooking the others. You don’t need to brush the pan with butter or oil each time. Adjust the heat as necessary. Store the crepes with waxed kitchen paper between in the fridge for a couple of days, or in the freezer for a few weeks.